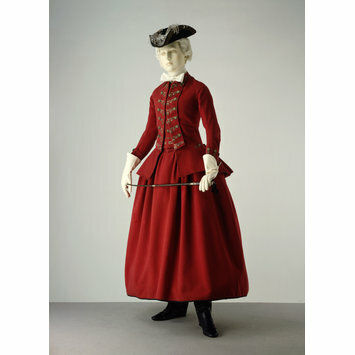 In the 18th century women needed practical clothes for riding, travelling and walking outdoors. This example illustrates how the styles of women’s riding habits were adapted from a man’s coat and waistcoat. The jacket is shorter than a man’s coat but has comparable buttons and trim. The waistcoat is also similar to a man’s version. 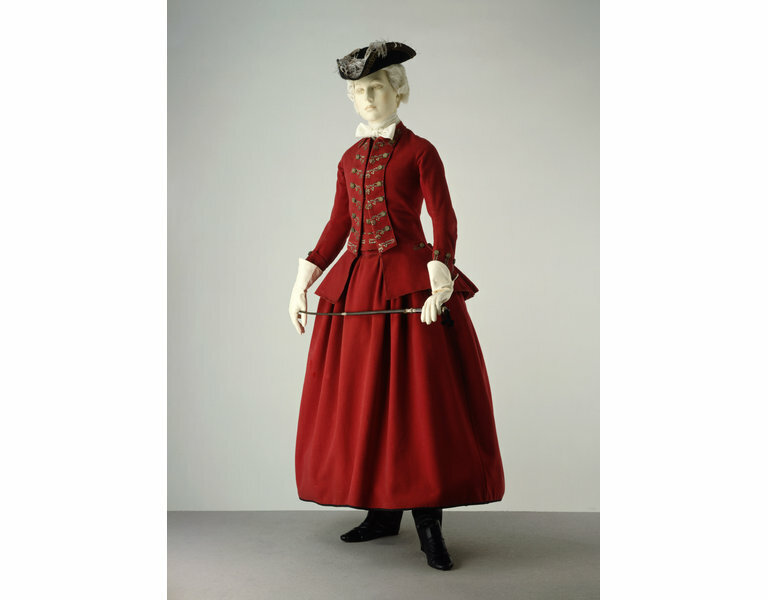 However, wearing breeches would have been unthinkable for a woman in the 18th century, so the petticoat was a necessary part of the riding habit. 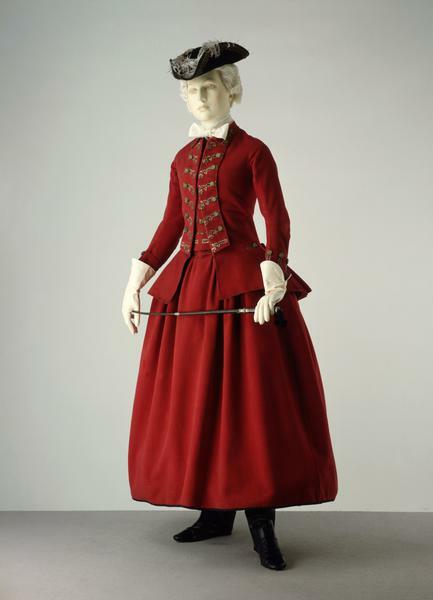 A woman's riding habit comprising a coat (jacket), waistcoat and petticoat. The coat is made of red broadcloth, with a turn- down collar and long sleeves with cuffs. The front edges are faced with red broadcloth and folded back to make revers. The coat is made with two fronts, two backs, two front skirts and two back skirts, with a waist seam and centre back seam. The skirts are faced with red linen, the fronts partly lined with unbleached linen and the sleeves lined with unbleached linen. There is a scalloped pocket flap on each skirt front. The collar, revers, cuffs and pocket flaps are embroidered with silver-gilt thread thread, in floral brackets. There are seven passementerie buttons, of silver-gilt thread and spangles, down each coat front (one on the bottom on each side now missing), three on each pocket flap and three on each cuff. The waistcoat is made of red broadcloth, cut in two fronts, with red linen backs. There is a belt of red wool across the front at the bottom edge. The fronts are faced with red linen and lined with unbleached linen. Each front is embroidered in silver-gilt thread in floral brackets. There are nine passementerie buttons of silver-gilt thread and spangles on the right front, with corresponding buttonholes in the centre of each bracket on the left side.